Motivated seller! 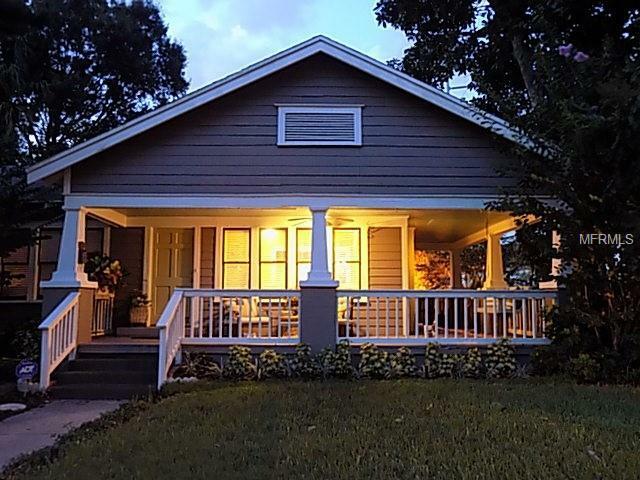 Come see this Charming bungalow in the heart of Virginia Park. This lovely home features large, bright rooms with HARDWOOD FLOORS and multiple windows splashing sunlight throughout. Wake up to enjoy mornings on the large, bungalow-defining WRAP-AROUND FRONT PORCH renovated with easy-maintenance, durable, cement composite decking. This gorgeous home showcases ample living space with a welcoming living room featuring a wood-burning fireplace and a master bedroom with an adjoining spacious sunroom (also, with a fireplace) framed by french doors, ideal as a private yoga/exercise/meditation space or as an artist's retreat. Unique to this style home is the over-sized, side entry, one-car garage with plenty of storage and an epoxy-coated floor. Enjoy the charm of this lovely residence, embraced by a beautiful avocado tree, in a neighborhood that is within a short stroll of South Tampa's blue-ribbon school district. Once here, you can walk or bike to great restaurants, coffee shops, spas, and watering holes along nearby Bay To Bay Blvd and MacDill Ave. You will appreciate the opportunity to take evening strolls along gorgeous Bayshore Blvd linear park showcasing stately homes, biking and jogging paths and an occasional dolphin or two. This home is what you have been looking for in one of Tampa's most desirable neighborhoods. Make your appointment today. (Photos show home as previously furnished.) Seller offering $5000 credit toward paint with full price offer.